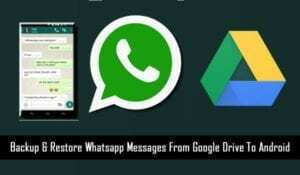 Download WhatsApp Database from Google Drive! WhatsApp is one of the most popular messaging applications which have been used by millions of users worldwide. Are you using WhatsApp? Then you might be aware of the WhatsApp feature in which WhatsApp keeps our all the chat or media backup on Google drive. Have you ever seen where the backup data are stored? No right? It’s because of the security feature of WhatsApp. But there is a way by which we can download WhatsApp Database from Google Drive. Continue reading to find the method to download WhatsApp database. Run WhatsApp -> Tap “Settings” -> Select “Chats” -> Click “Chat backup” -> Press “Back up to Google Drive” -> Choose a Google account to save your data to. Go to Settings >> Click on Chat. Click on Chat Backup >> Select the Google Account. 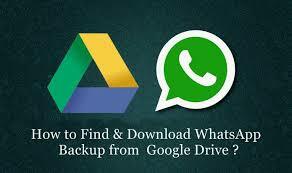 Then Click on Backup, Your WhatsApp chat backup start to create the backup in your Google Account Drive. Copy it into your Expandable memory or Send to your PC. Now your work is started: Go to Google Drive and log in with your same Play store Email ID and Password. Now, a pop-up box show on your screen and by default it is on the “General” tab just click on “Managing Apps”. Now, go to Google Drive; a pop-up box show on your screen and by default it is on the “General” tab just click on “Managing Apps”. The encryption technology used to backup WhatsApp on Google Drive cannot be applied to iDevices. That means you can’t retrieve WhatsApp backup from Google Drive to iPhone directly. Also, there is no way to transfer WhatsApp backup from Google Drive to iCloud so far. However, you can rely on a specialized WhatsApp Transfer tool to transfer WhatsApp messages from your old Android to new iPhone 8, 8 Plus, X, 7, 7 Plus, 6S, 6S Plus, 6, 6 Plus, etc. in a more straightforward way. Using phone Transfer tool is a good choice. There are many professional tools available for users to transfer all kinds of important data from phone to phone. Launch WhatsApp on your old Android device, go to Menu Button > Settings > Chats > Chat backup > Back Up, and back up the WhatsApp messages. Tip: if you need to back up WhatsApp messages locally, choose back up to Google Drive to Never. Install WhatsApp on your new phone and Check your old phone’s specifications to figure out what kind of SD card you have. To an Android phone with an external SD card, take the SD card out of your old phone, and put it into your new one. Run WhatsApp on the new device; verify the same phone number that you had when you backed up your chats. When the notification that a message backup was found pops up. Click “Restore”. Your device must be synced with Google Drive. Google Play Services must be installed (only available for Android 2.3.4 and later). Your Google Drive account must have enough space for all of your WhatsApp data. Your phone must have enough free space to create the backup. 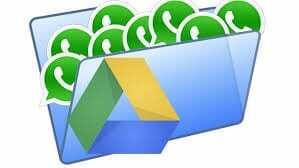 Backup WhatsApp messages on your old device to Google Drive, go to WhatsApp > Settings > Chats > Chat backup > Back Up. Add the same Google account to the new phone that was used to perform the backup on your old phone. Also, make sure you are using the same phone number on the new phone. After verifying the same phone number used to perform the backup on the old phone, you will be prompted to restore your messages and media from Google Drive. Once, the restoration process is complete, tap on “Next” and your chats will be displayed once initialization is complete. The backup process might take more time to complete, so make sure to leave your phone connected to a power supply for an uninterrupted power source. At Google Drive, you can also change your chat backup frequency at any time by tapping Menu > Settings > Chats > Chat Backup. 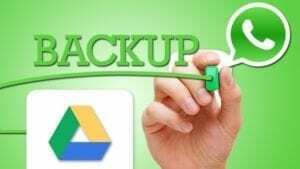 If you are using the same Google Account for WhatsApp data backup, the same Google Drive is overwritten; and there is no other way is available to restore an older Google drive backup. WhatsApp will ask you to restore chats and media from a backup when you verify your number. If you have both Google Drive backup and local backup for your WhatsApp, it will ask you to restore Google drive backup by default. Reinstall WhatsApp and verify phone number on Android device. Tap “Restore” when the backup is found. Check your WhatsApp chats after the restoration is done. 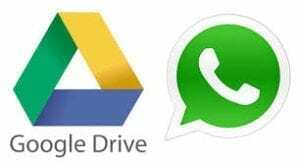 If you are sure that your deleted WhatsApp chats are in the most recent local backup, you have to disable Google Drive WhatsApp backup first. You can either log out Google account on your phone temporarily or delete your WhatsApp backup from Google Drive. Then perform the operation as described in the Google Drive backup part. Make sure you’ve logged in to your phone using your Google Account. Also, ensure that you’re having enough available space in your Google drive account to create a backup. Are you attempting to back up your data on a cellular data network? Then make sure that you have enough data available for using both WhatsApp and Google Play Services. If you’re unsure about the data pack available, please contact your service provider before you are ready to get started with your restoration process. In certain cases, if there is no data available, then try to create a backup over a different network. Example: Try connecting to Wi-Fi if you’re unable to back up over a cellular data network. While you’re trying to restore a backup, make sure you’re trying to restore a backup using the same phone number and Google account that the backup was created on. Check out the storage space available to make sure there’s enough space on your phone to restore the backup. Since the data restoration and backup takes more time, make sure your battery is fully charged or your phone is plugged into a power source. Make sure your phone has a strong and stable Internet connection. If restoring using a cellular data network does not work, please try Wi-Fi. Backup and Recovery features of WhatsApp has been engineered to eliminate some of the toughest challenges in backup and recovery and deliver the maximum value. Below are just a few of the cutting-edge features. WhatsApp Data Recovery can Backup solution is automatic and easy to manage. So there is no need to worry about the lost file or corrupted file, even if you accidentally delete the file, you can restore it from Google drive. If your hardware fails, your data can be restored in just a matter of hours. In the event of a phone crashed or OS failure, for example, the exact data can be duplicated to a new hard drive and get you back up and running as soon as the transfer is complete. Your backed-up data can also be deployed as a virtual server in case of catastrophic failures, such as a fire, lightning strike, flood, theft, or vandalism of your mobile phone. Your data can be made disaster-proof with the efficiency safe and secure feature of Google Drive. All the messages and media such as audio, video, image, PDFs, GIFs and all other file formats which you’re received will be automatically backed up frequently. You can also set the time limit on data backup. You don’t need to worry about compatibility with your older hardware. Advantage Backup and Recovery is non-disruptive and can be installed without impacting your normal business routine. Backup and recovery features of WhatsApp can be configured and modified quickly to meet the demands of your high paced environment. Whatever your situation is or wherever you’re, you can get easy access to your WhatsApp messages. Stay tuned with BulkQ to know more about the tips and tricks on WhatsApp! i lost my sim my whatsap account connected with google drive and i want to download my chat history photos with google drive any solutions ?